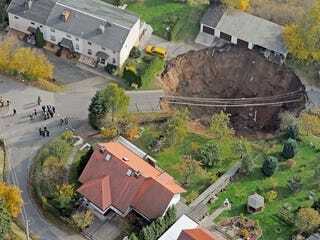 After Montréal, Guatemala, Tampa, and the Charlotte Motor Speedway, another giant sinkhole has appeared, this time in the German town of Schmalkalden, making 2010 the "Year of the Sinkhole." All Schmalkaldeners escaped with their lives, but the hole claimed an automobile and left several others teetering over the edges of radically reconstructed driveways. carbonate rocks undeground. There comes a point when the dissolved rock can no longer support the weight of structures above and it is around this point when you should run for your life. If you crave more of this fine example of extreme infrastructure, Der Spiegel and The Guardian have further photos of the incident.